Finally getting around to this.... Time to "share the love" as Pilar likes to put it. If you only like to catch coho, don't read this. But if you want to target kings, read on. Serious commercial salmon fishers don't use RSK's or little 2 hook mooching leaders. They use a big, single, long shank hook that can be a cable hook, a "crowbar" (solid durnickel shank) or a "baiter blade" attached to a hook. The cable is preferred since the fish can shake it's head all it wants, and that cable will flex along with it. The baiter blade is next best for avoiding the hook-spit. I prefer to only use solid shank crowbars on smaller baits. The little guys on the right are small crowbars used for anchovies or very small herring. Also note the "threader" needle. For these big herring I only use these bait snaps invented and made by Sonny Maahs (sold at Englunds). Sonny Maahs is legendary; one of the top, top, elite salmon trollers on the whole west coast, and a helluva nice guy too. This snap is a heavy wire. It will not come undone from ANY salmon. This is where several techniques diverge. If a guy is going to stick 200 or 300 baits, he's going to use the threader needle to pull the hook through the side. But if a guy has the time, like a smaller day boat or a sport fisher, you want to do a "split tail." So this is the split tail method. See how the hook is almost completely hidden? Give the hook a little jiggle to make sure you got it through the hole!!! There you have it. This is my favorite way to put a bait behind a flasher / dodger. I also used them this way on straight leaders when I commercial fished. This might seem kind of involved, but it takes me a minute or less to do it. One tip...be sure the herring is thawed out. If it is too hard, the tails tend to break when you try the filletting. When I get some anchovies, I'll do a spread on how to bait them with crowbars. Mark, that was very informative.. Thank you for taking the time to show us how its done. Nice post Mark. Thanks for the great info. Thanks Mark do you put any bend in the bait or keep it straight? May you always have fair skies,calm seas,fair currents,following winds and tight lines. .
Once you go Cat you'll never go back! Thanks for the demonstration. Do these baits spin, or does the flasher give them action? Hey Mark...thanks for the great post. I have one question. Why remove the tail? Does the split tail give the herring some tasty action? Sorry for the dumb question. Just because I can't, doesn't mean I won't!!!! Rick &amp; Maxcat... With a cable hook there is no bend. On a very large bait you don't want a bend anyways. These will run pretty straight, with a little bit of wobble. So the dodger / flasher will cause it to whip back &amp; forth a little more, which is perfect. With a very large crowbar, if a bait is behind a flasher / dodger, then no bend at all. If it's alone without a flasher, then a slight bend on the large baits, with more bend on the smaller baits. Basically, when a bait is behind a flasher, the flasher is providing most of the action so you want a "straight" bait, vs without a flasher, when you have to give the bait a little roll or wobble. Joe - my observation has been that with the tail in place (whether on a herring or an anchovy), and if you use a straight hook, the bait tends to spin on it's axis, which is very unnatural (and causes leader twist). So on a small anchovy, using a curved (bent) hook makes it roll instead. On these split tail herring, removing the tail takes out this spin, and causes just a slight wobble. Sort of like removing the rudder from a boat? Nice Post Mark. I'm going to try it. So as my mind runs amok, I'm thinking I might try this with some of those little buck shad I caught this week and see if the hali's like this method as well. Thanks once again, Mark, for sharin' what you know. Great pics too, by the way. Was Brenna handling the camera work? Great post Mark thanks for sharing. Captain @ Sharky's Charters Coos Bay, OR. I have seen those cable hooks at Englunds and thought, ..... :whazzup: :whazzup: :whazzup: :whazzup: .....then moved on still not knowing how they are to be used. Was this a paid advetisement for Englunds? Now I need more fishing tackle. Pacific Pork.....The Other White Meat! Thanks Mark for sharing.... lots of good info. Oh, that's good stuff, but it would never outfish an FBR. Sorry, inside joke. Seriously guys, cut and paste this post and save it. This is how all commercial fishermen fish bait and it works. If an RSK or plug cut was better, wouldn't they use it? It's SO much easier. The best part about bait on a crowbar is it will fish for a LONG time. Mark, you want to post one showing how to stick a chovie? Another way to do it is instead of using a bait snap (which I have NEVER done, GREAT TIP) you use a pin and a small length of copper wire. They also have these at Englunds. You just run the pin through the bait's head through the back hook and secure it in place with the light copper wire around his head. That is what the second hole is for on the crowbars and flat bars. I would try an FBR at RBH though. Give the gift of life. Donate Blood. Mark - You have outdone yourself! Excellent job. I might try pre-tying some of those for the upcomning June 19th opener. "If doing the right thing was easy, everyone would do it"
Kurt, yep yep yep! Like I said, I'll do a piece later on anchovies &amp; crowbars. Don't want to get TOO far into it without the pictures, but since you brought it up.... we always use pins &amp; rubberbands; the copper wire is tres obsolete, because they take so much longer to tie &amp; untie. On occasion we'd put pin/rubberband on a herring, so we could snap it on, if we were using mostly junk and didn't want that big Sonny Maahs snap hanging on a spoon. Here's an odd thing: on a herring the pin goes in front of the eyes (otherwise the mouth won't stay shut); on an anchovy, it goes behind the eyes. I should acknowledge my wife for taking the photos, all the while grimacing at what I was doing to that poor little herring. p.s. Walt... "I would try an FBR at RBH though"
Thanks for the post. I cant wait to try this. Thanks for the great post. Fantastic pictures! Have you ever tried the technique for Springers in the river? Can't wait to try it both here and up off the West Coast of Vancouver Island. 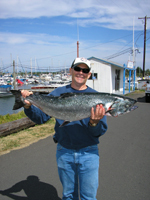 Just to verify the quality of the snaps, I was trolling off Tillamook a couple of years ago in the fall, lots of big fish in the 30-50 pound range were hanging right off the beach. I solidly hooked 12 fish that day and 9 of them came off due to snap failure (duolocks and butterfly). One of the veteran trollers helped me out by telling me about the "Fort Bragg" snap as he called it. Never had a snap fail since. Good design, good quality. Very nice, Mark. Can you ask Jennie if she will add this to the 'Tips' area or otherwise permanent storage? This stuff needs to be saved so we can all refer to it. How many boats run baited crowbars vs. just straight hardware? Should I not put a roll in 2 hook, RSK herring rigs when I run them behind a flasher? This has been a very effective technique. I've made it sticky for now. Later we can move it over to permanent storage in the tips section. (1) How many boats run baited crowbars vs. just straight hardware? &gt;&gt;&gt; It really depends. There are some guys who fish straight "junk" all the time. Other factors: time of year (junk early in the year, switching to more bait later in the year); also..how good is the bite? When fishing is scratchy, bait is an advantage. But when it is really wide open (the last 5 years in the west coast have been real good), I mean thick as cement, biting anything they throw out, and a good boat is getting 200 - 400 fish a day, they are using junk since they can work the gear a lot faster. A guy might start a trip off with 2, 3, or 4 hundred baits made up... if the fishing is hot &amp; he goes through them, he might not be able to keep up with sticking new baits for every leader, hence more junk in the water. Last, bait has been much more expensive the last few years, hence more use of junk. (2) Should I not put a roll in 2 hook, RSK herring rigs when I run them behind a flasher? &gt;&gt;&gt; Well John I know that YOU know how several variables come together to affect how you bait runs...like the leader test, leader length, length from the flasher to the hook, trolling speed, and how you actually set the hooks in the bait. So the old saying "if it ain't broke don't fix it" applies. Plus, our descriptions of "roll" and "wobble" might not be that different. What you definitely don't want is a bait that spins quickly on its axis. Also, you gotta realize the different reasons for using different gear on a commercial boat, such as: (a) large single hooks are easier to store / stage / process in a trolling pit vs an RSK with short hooks, which will make a mess...(b) large single hooks are way stronger (than a thin mooching style hook) and you need this big strong hook since there is very little give between that 30 lb'er and the trolling wire, and (c) on a commercial boat, to be fast and efficient, you need to be able to remove the hook from the leaders. Re-threading a new bait on an RSK would probably take too much time. I figured the ******* would be all about speed and simplicity. I will have to see about getting some of this gear at Englunds and giving it a try. Roll for me is a 1 foot or bigger barrel roll on the bait. Not the quick flip, flip, flip of a Coho bait that spins on it's axis. The RSK is pretty high maintenance but it allows just about anyone to get a nice bait roll. The combo that is working on 'Pilar' is a 4 foot 60# leader and a 4/0 trailing hook with a 5/0 top hook snelled fixed on the leader 4 inches apart. 60# because you hook Halibut and lings. This is all dragged behind an Abe and Al about 18" long with reflecto tape on one side. The action is a slowwwwwwww roll with a little jerk, jerk from the flasher as it rotates. At some point I am going to try Threemuch's trick of pinning the flasher on the ball to get rid of that drag on the line. Very cool set up. Thank you for sharing information with us. question what leader length do you run behind a Hot Spot at King speed, or from what Length to what Length if you follow water clarity?????? I thought your lay-out was very informative, and i definatly plan on trying it this summer. I was however wondering if there is any place locally that the gear can be purchaced. Great post and great follow ups. Man, I am continually amazed at how little I know compared to so many on this board. I am impressed! I'm not worthy. By the way, I am in Anchorage on business, it is way daylight out still and the guys are fishing the creek below downtown hard for big chinook. Very good info. Thanks. One question. 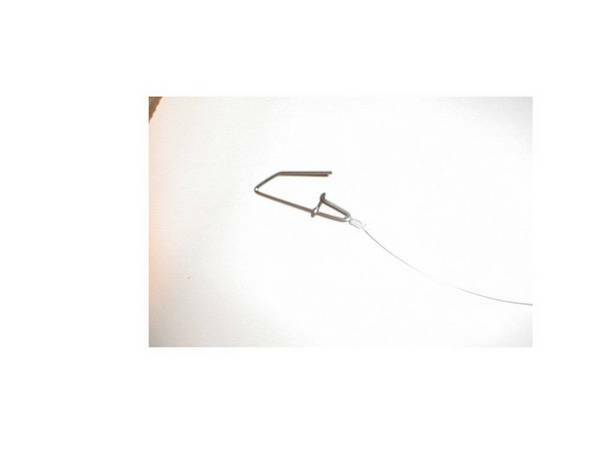 For sport fishing what size hook. 5/0? Or are these even measured like that. - leader length behind the flasher can vary quite a bit...smaller bait on a smaller flasher might only be 24 inches. Large bait &amp; large flasher up to 3 - 4 feet. Also, it should be proportional to the distance between the flasher &amp; the sinker or downrigger wire so the flasher is located about 1/3 of the total length, on the bait side. On commercial gear the total leader length can be 18 to 24 feet long, or even longer if big hogs are being targeted. Your troll speed affects it too (faster=longer; slower=shorter). You just have to experiment around with all the variables. - the 5 to 6 inch hooks have a 7/0 to a 9/0 gap. For hook size I don't distinguish between "sport" and "commercial" gear; rather, I choose the hook by the bait size. For a mojo Yaquina Bay herring, it needs a large hook. For a 4 to 5 inch bait, I use a 4 inch hook in a 4/0 size. Everything is proportional! They are sized by: length / gap. For example a 3 1/2 - 4/0 is a 3.5 inch long, 4/0 gap. Marc, great writeup &amp; pics on baiting the herring. When is the next feature story coming out for the crowbars? Very good info. Thanks for taking the time to put it together. So not only is the RCD (ala Frankonator) known to this group but the FBR too? Or is the FBR really an inside joke? Excellent description of the baiting process. Down here our intent seems to be to get as tight a spin (bullet rotation) on the bait as possible when fishing for Kings. 19 Ft Arima, the "Nancy H"
Give a neighbor a fish and he will always be there when you are cleaning your boat. Teach a man to fish and he is always looking for a seat. First, thanks so much for this post. If there were a "best of ifish" award for both the quality of the advice and the quality of the presentation, this post would have my vote for sure. Second, I went to Englund's in Astoria yesterday (13 July 2004) with a printout of the first three pages of your post as reminders of what I wanted to buy. Well, guess what? There's been a run on the cable hooks and there were absolutely no snaps left at all. Moreover, Englund sales guys said, "What is going on here?" and were more than curious to look at the printout. Finally, Sonny Maahs's snaps have been backordered for a long time, according to the folks at Englunds. Is there another source? Are they still available? PostScript: While I was trolling the store for other necessities, a member of the staff rushed out to tell me that more cable hooks had just arrived. They refilled the bins and I was able to choose a few more to complete my kit. So, if other ifishers were frustrated by a lack of choice at Astoria Englunds, check again. I also picked up several lengths of "commercial blades" and some Gamakatzu siwash hooks. And, 'till we find Mr. Maahs's clips, I found the escutcheon pins and rubber bands that can also be used to affix the bait. posting, I called Maahs Marine and spoke with Donna. She says, "Well, Englund just called yesterday and we're filling their order..."
Sonny, also known as Bill, is out fishing this AM. At 74, it's getting harder, but a grandson has stepped in. Lastly, the reason that Maahs snaps are a bit slow to market from time to time is that Bill and Donna make them by hand. They sit and watch TV, Donna makes a start, and Bill finished up. "But after a while, your hands cramp up." Donna explained. So, that's the real secret here: Mark Mc is fishing with hand-made snaps. Hand-made jigs, hand-made spinners, hand-tied leaders are all fine, but I've never knowingly fished a hand-made snap. Phoebus.... you just made me realize something. Since us fisherfolk are a superstitious bunch.... Sonny himself touches every snap....he is a truly great fisherman with a heart of gold.... maybe it puts a good mojo on those snaps!! I can see how the crowbar and cable hooks could be inserted in the bait per your instructions. What about the blade/hook combinations? Would these rigs need to be pulled through the bait with a threader? Regarding "baiter blades"... I use those quite a bit too. In one regard, they are actually easier to thread than a cable, because they are stiff. So no, I usually don't need a threader for the blades. However, because they use a short shank spoon hook, the eye creates a bulge, especially on a smaller (read narrower) bait. So if you go up the side of a bait, it can tear a noticable hole upon entry, and a bulge from the eye may show, which is an imperfection, and we don't like any imperfections on our bait. If you do a split tail however, the eye enters from inside so there is no tearing, and the bulge is less noticable. I fished using a simplified version of Mark's baiting technique on 7 and 8 August, off the Columbia River. I used the cable hook and fresh herring (from TackleTime) and targetted Coho. I baited the hook by first running the shank of the hook through the mouth of the bait and out the vent. Then I ran the shank from vent to mouth, turned the hook up along side the tail of the bait, and secured the mouth with a Maah clip. I trailed a 6 foot leader (w/ a swivel midway) behind a diver, trolled ~2 knots w/ 8-15 (2') pulls. We took 8 Coho divided evenly between natives and hatchery fish. My four fishing partners (2 each day) each caught their first salmon, which was rather cool. What I particularly like about this setup for Coho is the ease with which the cable hooks can be extracted from the native fish. after the second and third run from the boat. Thanks for the great information w/ photos. Now I know what to do with those stange hooks that I don't even know how I got. Great Post, I'm ancious to give this a try on Land-Lock Chinook in Couer d'Alene Lake, where we currently use Helmet Head Herring setups. Do you know if these Clips/Hooks can be ordered online anywere. If not is Englunds in Portland or ?, I work up and down the Wa. Or. Coastline on occasion so I can swing by Englunds once I know where it is! Wow, that was like sitting in on a fishing seminar! Thanks for the education! Is this rigging legal for sports fishing? Size/Length? This is an Outstanding job of illustrating your technique. making a "living" is not the same thing as "making a life"
Where can I buy Hooks like these? I'm looking for a link to buy some crowbar hooks. I need some different sizes. Man, what a great post! I edited it so it no longer scrolls (changed the bmp files to jpg). Where do you get the hooks, threader?